Michelle Obama's involvement with a secondary school in London had a substantial positive impact on pupils' GCSE results, according to a University of Bristol academic. Mrs Obama visited the Elizabeth Garrett Anderson School (EGA) in Islington in 2009, invited pupils from the school to meet her in Oxford two years later, and finally brought 12 pupils to visit her at the White House in 2012. Professor Simon Burgess, from the University’s School of Economics, Finance and Management, studied the effect of her association with the school. He analysed EGA’s GCSE scores from over the past decade, compared to London state secondary schools. He found a slight rise in scores from 2009 to 2010, while the 2012 score was substantially above 2011. Professor Burgess said: "Those results focus on the overall effect, but since Michelle Obama was encouraging very high performance and aspirations it is important to look specifically at high performance too. The school averages of the number of A*, A or B grades its pupils achieve is very striking: a sharp increase in EGA relative to the rest of London in 2012. If this is really a result of Michelle Obama’s interventions, then it is a big effect." 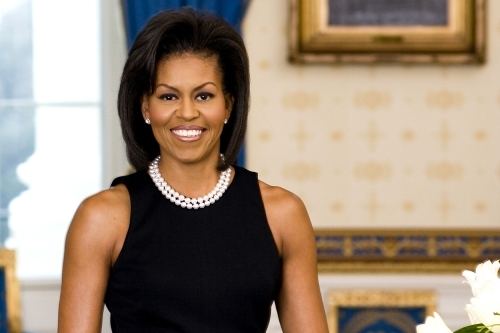 Michelle Obama grew up in a poor neighbourhood in Chicago, but made it to Princeton University and Harvard Law School, before joining a prestigious law firm. During her visit to EGA, she talked about how the pupils of EGA had the capacity to do as she did – to use education to get on in life. Professor Burgess said: "In general terms: 'I did this; you could too', can be a very powerful message if delivered by the 'right' person. Michelle Obama was that person, and her words had an effect – you only need to watch the news videos to see that the pupils were genuinely inspired. "It is clear that the pupils of EGA were hugely inspired by meeting Michelle Obama and her words to them about the importance of education and hard work. What can we learn from this? First in terms of what matters for achievement, this supports the idea that inspiration and aspiration and effort are important, potentially very important. EGA was by no means a low performing school, and yet this injection of inspiration made a big difference. "Second, if pupil effort is important, then we need a much better understanding of pupil motivations – how do we inspire pupils to greater engagement? This seems to be me to be a key question, one deserving much more quantitative research. "Finally, the policy implications are both easy and hard. We need to get inspirational role models into schools to talk to pupils about the importance of education. For example the Inspiring Women Campaign does precisely that on a large scale, including one meeting at EGA in 2014. The hard bit is finding speakers with that close connection to the specific pupils, to make it believable to say 'I was like you; you can be like me'."